The Yankees announced after the game that Ramiro Pena made the team, Angel Berroa was sent down and Dan Giese was placed on waivers. I don't think this is a big deal since once Alex Rodriguez comes back, Cody Ransom will go back to this role and Pena will go back down but it does signal the change in philosophy the Yankees have had with younger players. They are really trying to mix in the younger guys and it shows with Pena, Gardner, Joba, the bullpen guys, Phil Hughes, Robinson Cano, Melky Cabrera. Mark Teixera, CC Sabathia are also younger guys as well as Nick Swisher. The Yankees seem to be getting younger and more athletic with a mixture of veterans but soon you may see guys like Austin Jackson and Jesus Montero as well to replace the older veteran guys. A quick other note is that Arod can technically come off the DL on April 11th, he won't but he could, I expect him in Tampa this week and to be back the first week of May. The Yankees will take on the Baltimore Orioles at Camden Yards for 3 games. CC Sabathia makes his debut on Monday against Jeremy Guthrie. The 2nd game will be Chien-Ming Wang vs Koji Uehara and the final game will be AJ Burnett vs TBA. I would expect the Yankees to win 2 out of 3. I don't know anything about Uehara as he is making his debut and the 3rd game will probably be a rookie also. The Orioles are showing signs of getting back to respectability with some good young players but at this point the Yankees are just better and should beat them. I think Guthrie is a good pitcher but CC Sabathia can dominate that young orioles lineup and if the Yankees scratch out a few runs and maybe get to the bullpen they will be fine. The Yankees ended their exhibition schedule today with a 10-1 win over the Chicago Cubs. The Yankees were very impressive this spring going 24-10-1. They won 10 in a row to finish and 19 out of their last 21 games. These stats mean absolutely nothing but they are interesting and Joe Girardi seems to like that they have fostered a winning attitude and got used to winning. The Yankees had one of their best exhibition records ever. The bottom line is their pitching was great and if they get that, it will be hard to beat them. The Yankees have also been getting production out of their big guys who were hurt last year, Matsui, Posada and they change the whole linup even without ARod and of course Tex is a huge addition. Robinson Cano looks like he has learned his lesson and should be a huge upgrade over himself from last year. The Yankees 5 man starting rotation was 13-3 with a 3.35 era this spring. They allowed 37 runs in 99 1/3 innings and that is including a couple of bad starts from Joba and CC in the spring and AJ got lit up one start also as well as Wang. The point here is if these guys are taking the ball basically every 5th day they will win a majority of the games they play. Mark Teixera had the highest avg 433 and most hr 5 and rbi 15 on the team this spring. He usually gets off to slow starts but lets hope he keeps this up going into the season, I am sure he feels great and ready to go. Jorge Posada caught in 12 games this spring and gunned down 6 out of 12 runners trying to steal on him, he seems fine. The Yankees just have to keep an eye on him but he should be good to go and he may be the most important guy on this team other then maybe MO. The Yankees get it all started on Monday afternoon at 4:00pm on YES at Baltimore. CC Sabathia takes the mound against Jeremy Guthrie. 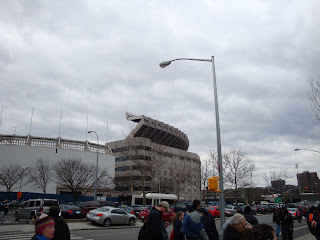 I parked on the street about a block from the stadium so I walked down along the side of the stadium. I noticed the new garage which is very nice first, too expensive though and I don't pay to park hardly ever. As you walk down along the side of the stadium there are huge pictures of Yankee players which is a very nice touch. The players entrance to the underground parking garage is very interesting, they have huge pillars that go down when the players need to get in and they stop everyone from walking. The main entrance to the New Stadium is very nice, they have vendors outside and you can still see the old stadium. The lines to get into the stadium are a lot quicker and better organized, you scan the barcode on the ticket and go right in. 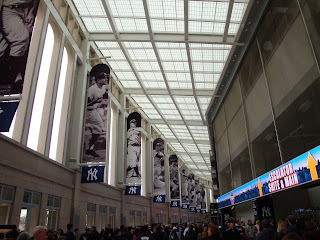 The first thing you see when you enter is the Great Hall which you are in, there are huge banners above of all old Yankee players, if you go straight there are elevators and escalators. You can go to the right and there is a huge HD video screen and you can walk up the ramp to get to other levels of the stadium including the NYY steak and the Hard Rock Cafe as well as the Yankee Museum. The stadium is very well marked with signs and it is pretty easy to navigate around, there is a Yankee team store to the right also as you first walk in. The Great Hall is just amazing and this will be a main meeting point for people I am sure. The field itself looks like the old field, I love the frieze back up on top of the stadium all the way around. The huge HD scoreboard in CF is amazing, it is so big and clear. I like the armitron clock in the outfield all the way up top in left center. The concourses are so much wider you don't feel so cramped and that you are constantly bumping into others like the old stadium. There is so much room to walk and wander around, you walk up from your seats right to the bathrooms and concessions and it is all open so you can just turn around and watch the game, also I like the fact you can walk around the main level or wherever you want and stand and watch even if you don't have a ticket there. The old stadium they would make you keep walking, no stopping without a ticket. The stadium is just amazing, it is breathtaking, there is any kind of foods you could want from PBJ for the kids to the restaurants to Jhonny Rockets and spanish and Japanese food. I don't think they missed a thing in this stadium. There are Tvs all over the place also so you don't miss anything. The between innings stuff and music is pretty much the same although they didn't do the YMCA today. I hope everyone gets a chance to see this Grand Stadium, it is just a treasure. The key of course though will be the team, if the team wins it will continue to be a great place and if they don't then it won't be as great. It is hard for me to describe in words but I tried to give as good of an explanation as I could, if you have any thoughts or questions please comment and I will gladly try and anwer. 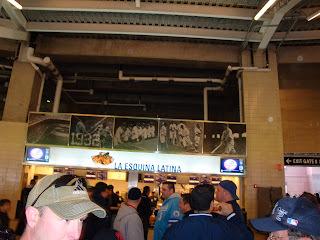 The staff was very friendly and I hope this continues, at the old stadium there seemed to be some grump employees. I did not see Freddie but I am sure he is still around. I t I took an assortment of field and all over the stadium, to the right is the great hall and above it is just a concession stand. I have the Old Stadium below since it is still standing. Here is the outside of the main entrance to the Stadium. I am about to head out to the stadium and I will have a lot more later on when I get back. I do not have the lineups or anything because its too early but it should pretty much be the same as yesterday until the 5th inning. AJ Burnett gets the start and Andy Pettitte will pitch the second half. I will be looking to see how much more room there is, where everything is, where I will be sitting etc. I am very excited to be going and can't wait not only to get out there but for Monday and the season to begin. I know it doesn't matter but once again with yesterdays victory the Yankees have now won 9 in a row again, maybe they need to lose today before starting the season, it kind of makes me nervous. I will be back later on with much much more, remember to check back and for anyone heading out also, have fun and don't worry the weather is going to get better. I hope this continues to be a theme when the games count,the New York Yankees beat the Chicago Cubs 7-4 tonight in the first game at the New Yankee Stadium. I liked the coverage as YES did a great job with that, I really enjoyed seeing Kim Jones and Bob Lorenz around the stadium showing different things during the game. Chieng-Ming Wang looked a little off to me but he hung in there and reached the amount of pitches he wanted too. It was nice to see Robinson Cano hit the first homerun in the New Stadium and Derek Jeter get the first hit. I think Robbie Cano looks great and I think he will have a huge year. It was good to see Hideki Matsui drill one and also Cody Ransom hard not to like and root for this guy. 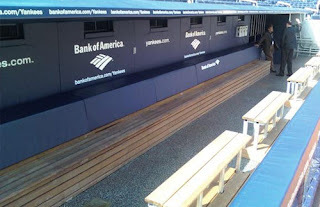 The bullpen looked great as I don't think they allowed a baserunner between MO, Albaladejo, Veras and Ramirez. The stadium was the star of the show and I am going to talk about some things. The one thing that they said on YES and I noticed right away was how much the new stadium looks like the old on the field. The Great Hall looks great and so does the huge scoreboard in CF. It looks like people can mingle around the ballpark more and there is a ton of room. I am more of an oldschool guy that doesn't get up from my seat until the game is over but it seems nice for people that do get up and that you never have to miss a pitch since it is open. 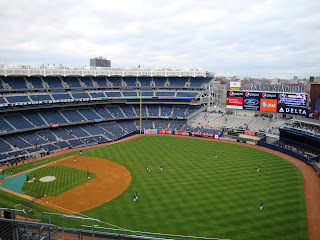 It was hard for me to tell if the upper deck is closer, i will be checking out the view from all over tomorrow when I am there and can report on that. The clubhouse looks great and I am sure Kim Jones will have fun tracking guys down in there. 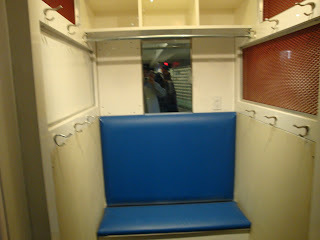 I can't believe the players have their own lockers for just their bats. It will be interesting to see how the field plays, which the players said to check back with them, the infield looked a little fast but it was wet and the grass hasn't had time to grow. The stadium got a test with the rain and really seemed to drain well. I can't wait to tomorrow and I will have a lot more then and Monday we start the long journey that hopefully will culminate in a World Series Title. This from the Yankees: CHESLEY “SULLY” SULLENBERGER TO THROW OUT CEREMONIAL FIRST PITCH AT YANKEE STADIUM ON SATURDAY, APRIL 4, PRIOR TO YANKEES’ GAME VS. CUBS The New York Yankees today announced that Chesley “Sully” Sullenberger, the pilot of Flight 1549 who successfully landed the impaired plane safely on New York’s Hudson River in January, will throw out the ceremonial first pitch prior to the start of the Yankees’ 1:05 p.m. exhibition game vs. the Chicago Cubs on Saturday, April 4. The Yankees will honor “Sully” (a Yankees fan since boyhood) as well as Flight 1549 co-pilot Jeff Skiles and flight-crew member Doreen Welsh in a pregame ceremony. In addition, the Yankees will welcome Challenger, the renowned American Bald Eagle, who will fly across Yankee Stadium from the top of the Bleachers Café to the pitcher’s mound at the conclusion of the national anthem. The Yankees had a beautiful day to workout in their new home. There were a bunch of players who couldn't wait and when them got home last night went right to the stadium even before going home. Sam Borden has a nice video tour of the stadium on lohud.com and there is a lot of information from Kevin Delvaney who covered the workout today for Peter Abraham who was off today. You can also get a great feel over at http://yesnetwork.com They have lots of pictures and reaction. I am going to start with the players reaction, I will have my own reaction and thoughts about the new stadium and may try to give a tour with pictures and words. Joe Girardi: "“Last night when we walked in, it felt like it was Christmas morning. 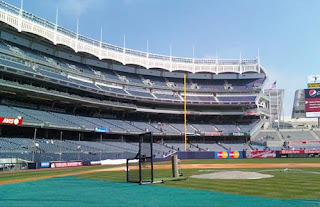 Just listening to players talk about it, and the excitement of visiting every nook and cranny in the ballpark and in our clubhouse, it’s an unbelievable building.” Andy Pettitte: “I was out there last night and, the dimensions, it looks exactly like the old ball park. You just look from the dugout, it looks like it’s going to play big in left and there’s a short porch in right. “Obviously you walk through the door and see this, the clubhouse. Just the facilities we have, how beautiful everything is and the lighting, it’s state-of-the-art. For me, I’m a big-time whirlpool guy. We have unbelievable facilities as far as swimming. It’s just unbelievable.” Joba Chamberlain: “You’re kind of in awe at first. It’s like having a new toy. You want to come in and play with everything. “It’s going to be a little bit different because you have to get adjusted to the backdrop. You have to adjust. Your depth perception is different everywhere you go. So we’re going to have to get out there on the mound and just get your surroundings.” Derek Jeter: “Homefield advantage is in the crowd. Our fans are always going to be the same. The atmosphere is what makes it fun for the players, so I expect it to be the same as it’s always been.” Mark Teixera: “It’s special to be a part of this. It’s going to be the greatest the sports venue in the world. We’re going to be excited to be playing on it for a long time. “I loved playing in the old stadium. It was my favorite place to come to as a visiting player and I’m going to miss it. But when you come in here, it makes you forget about the nostalgia a little bit.” Johnny Damon: “You could see by the looks on some of our faces that Christmas came a little bit early this year. My first thoughts were that we’re very fortunate to have a place like this. The old Yankee Stadium was definitely very special. This player is special from the moment you walk into it. As a player, you’re fortunate to put on the Yankee pinstripes and have this nice new ballpark.” I am lucky enough to be going to the game saturday and as I said before will provide a preview of the stadium. I also lucked out as Saturday is the better day, it doesn't look good for tomorrow and who knows what will happen if they can't play. I wonder also if they want to risk health of pitchers on a wet mound?? I guess we have to wait and see what happens. Saturday is going to be nice but windy which I will take over the rain. The Yankees are in the midst of their workout at the New Stadium and their is no game today so no news. I will have something later when everyone posts their reports of the workout. It turned out to be a nice day and it will be interesting to hear what the players say about their new home. I can't wait until I get to the Stadium on Saturday morning, only 2 days away now and only 4 days until opening day. I forgot to mention this before maybe because it doesn't mean much of anything although it did to the Rays last year who rode the grapefruit league success to the World Series. The New York Yankees won the grapefruit league title with a 22-10-1 record, they lost 2 more games to Team Canada and Team USA but that didn't count. I got tired of reading these articles against the Yankees. I know Ken Rosenthal of foxsports.com was trying to be funny with his article about the Yankees getting ready for a circus this year but I didn't find it too funny. The Yankees won 89 games last year with Carl Pavano, Dan Giese, Sidney Ponson and Darrel Rasner making a lot of starts and Ian Kennedy and Phil Hughes going 0-9. The Yankees pitching this year is CC, Wang, AJ, Pettitte and Joba with good arms in the pen. I don't see how the Yankees don't win 95 plus games unless they have major injuries. I understand why cynics might say well lets see Posada get through a whole season and Matsui. Damon and Jeter are just getting older and Mo also. I can only say that so far so good for everyone, if these guys stay relatively healthy then there really isn't much weakness. I also ask you well what about Boston with Lowell, Papi, JD Drew, Wakefield. These guys have injury questions not to mention Beckett. This is the first full season without Manny and is Dice-K really as good as he was last year or just lucky with all those walks and wiggling out of trouble. Who is their fifth starter, ok John Smoltz might and I say might come back and if he does he is old and in the AL East now. I think Boston is a very very good team but I don't think they are as good as everyone thinks. I think CC is better then Beckett but you can call it even if you want. Wang or Lester, I will take Wang. AJ or Dike-K, I will give them Dice-K but what really seperates the Yanks in my mind is the backend Pettitte and Joba or Wakefield and Penny/Bucholz/Smoltz. I will take that, and I don't think the bullpen of Boston is so much better, I think they are pretty good there but so are the Yankees. I would take the Yankees lineup, they have a better left side of the infield and catcher, and as good as Youkilis is I would say Tex is better, I will give them Pedroia but I think Cano will be a lot closer this year and I will give them CF and LF but not RF. It will be a close battle but I see the Yankees winning the division. I didn't forget the Rays but I look at the Rays as not suprising anyone this year and they can win around 90 games either way but their pitching went way above the amount of innings they ever have and usually the next year is trouble for guys like that. I don't think the pitching will be as good and everyone is gunning for them now, not taking them lightly. I do think the AL East has the potential to have the 3 best teams in baseball but the Yankees are due to come through in the end, I think they have more of the teams like they used to have with pitching, defense and less emphasis on the slugging and they just have a lot of heart and determination and good chemistry. I know Arod will be Arod but they are used to that now and I don't think it ill affect them. Lets go Yankees. There was a report today in the New York Times that Bob Sheppard is retiring, we found out yesterday that he won't be there for the exhibitions this weekend or for opening day. Bob Sheppards son said that this isn't true but the thing is he hasn't done a game since 2007 and he is ill and believed to be 98 years old so I don't think we can realistically expect him. If I were the Yankees why can't they get him to announce from his house and then have the recording for all time, no one else should be the public address announcer other then Bob Sheppard. I hope with the technology we have today they figure out a way to do something where he is the guy to announce everyone. Does anyone else have any ideas, if you do I would love to hear them, I am sure we can come up with something. The New York Yankees have now won 8 in a row and 17 of 19. They keep winning and of course some people are saying its because Arod is away LOL. The bottom line is if the Yankees are healthy and they pitch they will win, they have great pitching. I would like them to lose friday, not Saturday when I am there. They won today by a score of 8-5, they were winning 8-2 and one of the minor leaguers I don't know anything about gave up 3 runs in the 9th. CC Sabathia started and gave up 2 runs in 3 2/3 innings giving up 6 hits, he had 1 walk and 5 strikeouts. This was just a tuneup and he said he is ready for Monday when the season starts. Jose Veras pitched 1 1/3 innings, 1 hit, with 1 walk and 1 strikeout. Damaso Marte pitched a perfect inning and s did Brian Bruney who had a strikeout. Bruney has put it together lately after a rough start. Steven Jackson closed out the game getting the one batter out he faced. Mark Teixera was the offensive star going 3-3 with 3rbi. He stated he has loved working with Kevin Long and wished he could start the season tomorrow. He was on Michael Kay today and said they are having so much fun, working hard and they have the attitude if they continue to work hard and stay healthy then no one can beat them, its all up to them. Hideki Matsui was 2-3 with 2 rbi and a walk. He hit a 2 run homerun, Jorge Posada was 1-3. Robinson Cano was 1-2 with a walk, Nick Swisher was 1-1 with a rbi and Cody Ransom was 1-3 with a rbi. The Yankees may be on their way home now, im not sure what time the plane left. They will have a workout tomorrow from 1:10-3:10, gates open at 11:00am. The workout is not open to the public, members of the community and certain season ticket holders got tix for this event, also tomorrow they have the special ceremony with Bernie Williams at the Hard Rock Cafe in the Stadium. 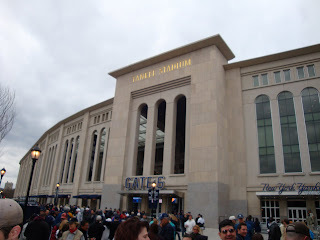 Check out the lohud yankees blog with Peter Abraham for reports at http://yankees.lhblogs.com/ I will have my report from the Stadium at some point on Saturday evening. I forgot to write about yesterdays minor league happenings so please forgive me. Phil Hughes was scratched from pitching yesterday but not because he was injured. He said today he was just as shocked as everyone else. He will be pitching tomorrow instead and is not sure why they shifted it. Ian Kennedy pitched 6 innings giving up 6 hits, 3 runs with 7 strikeouts. Mariano Rivera pitched in this game giving up a solo homerun but then getting 5 outs. He had 2 strikeouts. Kevin Whelan pitched 1 2/3 innings giving up 4 hits, 2 runs, 1 walk and 2 strikeouts. Ian Kennedy has looked good since being sent down to minor league camp, he has been working on getting his curveball down in the zone and it has worked so far. Austin Jackson was 1-4 with a rbi, Shelly Duncan was also 1-4 with with a solo homerun. Juan Miranda was 1-3, Edwar Gonzalez was 1-1 with a rbi. Todd Linden was 2-4, Eric Duncan 1-4 and Kevin Russo 2-3 with a sac bunt. Chris Stewart was 2-2 with 2 rbi. Shelly Duncan had a nice juggling catch running into the wall in the outfield. Austin Jackson almost had 2 diving/sliding catches in CF. Thanks to Chad Jennings for doing a great job with the minor league information and don't forget to check out his blog at the times tribune. The New York Yankees won their 7th in a row today and 16th out of their last 18. They defeated the Cincinatti Reds by a score of 6-3. Joba Chamberlain got the start and went 5 1/3 innings giving up 2 runs on 5 hits with 3 walks and 6 strikeouts. He said the ball felt better coming out today and his velocity was up. He hit 96 on the gun and was at 95 throuout the game, he tired in the 6th but had a good day. He does still have to work on getting his pitch count down which he said after the game but he will get better with that and remember he is the 5th starter so he will be going up against other 5th starters which aren't very good and the Yankees can score runs for him. He has a 2.77 era over his last 3 starts and has a tuneup on Sunday left. I don't know about you but I would take a era of that from the fifth starter, he only has to pitch to a 4 era or so and that would be great. Brian Bruney came in to get the two hitters in the 6th with one strikeout and Edwar Ramirez pitched one inning giving up a hit and run. Phil Coke pitched a perfect inning with 2 strikeouts. Phil Coke has just been outstanding this spring, I don't have the numbers in front of me but he has been a strikeout machine and has a 1.42era. Dan Giese finished the game with a perfect inning striking out two. Melky Cabrera after losing out on the CF job was the offensive start today going 1-2 with 3 rbi. Brett Gardner was 3-4 with a rbi, Mark Teixera was 1-2 with a walk and Cody Ransom was 1-3 with a rbi. Angel Berroa was 2-4 and Ramiro Pena was 1-4 in the battle for the last roster spot. The Yankees will play their final spring game in Florida tomorrow against the Phillies at Steinbrenner Field. 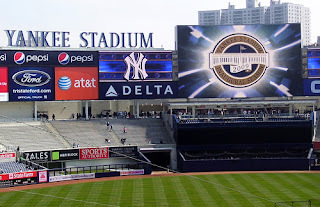 The Yankees will be flying to NY tomorrow evening and have a workout at the New Stadium Thursday before playing the final 2 exhibition games their friday and saturday against Lou Piniella and the Chicago Cubs. The Yankees issued a press release today that Bob Sheppard will not be their for the 2 exhibition games or the home opener. Brett Gardner won the James P. Dawson award for most outstanding rookie in camp. I hope he fares better then past winners which have included Bubba Crosby, Shelly Duncan, Kei Igawa, Eric Duncan and Andy Phillips. They did have Tony Kubek and Tom Tresh win it and go on to win rookie of the year the same year. He batted 390 with 2 doubles, 2 triples 3 hrs and 7 rbi. He leads the team in hits and stolen bases. The Yes Network had a good night last night picking up 13 emmy awards. 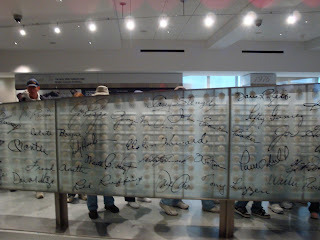 I am not going to go through the whole list but you can check it out on Peter Abrahams blog http://yankees.lhblogs.com he has all the names and what they won listed. This is the most they ever won and the most by a NY regional sports network. I didn't mention this earlier but on Thursday when the Yankees have their first workout at the New Stadium the Hard Rock Cafe will be opening up with Bernie Williams along with Ace Frehley(Kiss), Scott Ian and Frank Bello(Anthrax), Darryl "DMC" McDaniels(Run DMC), Anton Figg(Late Show Band). They will be signing Take Me Out to the ballgame along with students from the Bronx. There will be a celebratory guitar smash also, Bernies new CD will be released April 14, he has his performance with Bruce Springsteen on it, they performed Glory Days. The New York Yankees defeated the Toronto Blue Jays today by a score of 3-1. The Yankees including the Team USA and Canada games are now 20-12-1, they have now won 6 straight and 15 of their last 17. This doesn't mean much as it is spring training and it doesn't count, the thing that does mean something though is that their pitching has been there pretty much day in and day out. The Yankees have the pitching all around this year and when you get good pitching you always have a chance to win and that is why they have been winning all these games even though its spring training. Andy Pettitte got the start today going 6 1/3 innings giving up 1 run on 5 hits with 0 walks and 7 strikeouts. The other thing I have been noticing about the Yankee pitching is they haven't walked too many and they do strike out a lot of guys. Damaso Marte pitched 1/3 of an inning giving up a hit and thats all. Jose Veras pitched an inning giving up a hit and thats all and Edwar Ramirez finished it off pitching an inning with 0 hits, 0 runs and 1 strikeout. Andy Pettitte was thrilled with what he did today and said his shoulder has been doing great, no trouble at all. If you count the two minor league games Pettitte has pitched 22 innings this spring and allowed 3 runs with 18 hits and 20 strikeouts. The offense was led by Mark Teixera who had 2 rbi going 2-3 with a walk, he also made a diving stop in the field, this is going to be a huge difference this year with him, the Big G was just a statue and he is going to make that whole infield so much better. Drek Jeter was 1-2 with a walk, Melky Cabrera was 1-2. Johnny Damon had 2 walks and Jose Molina was 1-4. Mariano Rivera will pitch in a minor league game tomorrow then one of the Cubs games, he does not need to pitch back to back days before the season Joe Girardi said today. The Yankees will finish up their grapefruit league schedule with a game tomorrow at Cincinatti and then home wednesday against the Phillies, they will head to NY Wednesday evening and have a workout at the new stadium on Thursday. They play the first 2 games at the New Stadium on Friday night at 7:00pm and Saturday at 1:00pm. Brett Gardner was named the starting CF by Joe Girardi after todays game. He said the plan is for Melky to be on the team, so if he isn't traded he will be the backup. I think this is the right move, Gardner played so well at the end of last year and this spring, he takes better routes on balls, has unbelievable speed. When he gets on base he just creates havoc, the only thing Melky does better is throw the ball. Melky will have enough chances to play though, he can play LF when Damon gets a off day, or come in late for defense there and if Gardner doesn't play well and he does then he will be back in CF. Girardi said they both played well this spring, and that Melky had a tough year last year but came into camp ready to go. Melky said he was disappointed but will do whatever he can to help the team. I am wondering if he will also announce the bullpen and the utility guy which really isn't a big deal since it is only until Arod comes back then Cody Ransom will go back to that role, more later as it develops. I am not trying to neglect the Mets but just have forgotten to write about them. The Mets defeated the Florida Marlins yesterday 5-4. After the game Jerry Manuel still wouldn't commit to anyone as the fifth starter even though we assume its Livan Hernandez, he said he likes the kid Gee. It appears Jose Reyes will be the leadoff hitter followed by Luis Castillo, Carlos Beltran, Carlos Delgado. I think this is the right choice, if you hit Castillo 8th it would hurt him I believe. He has looked good this spring so maybe the Mets will actually get something out of him. Mike Pelfrey got the start for the Mets today against the Orioles but because of a long rain delay only threw 13 pitches and then they didn't bring him back out after the delay. He will pitch 90-95 pitches on Thursday. The Mets were defeated 5-1 on a rainy, muddy day. Brian Stokes pitched 2 2/3 innings giving up 2 hits and 2 walks with 0 runs. Sean Green pitched an inning giving up 1 hit, 1 run with 1 strikeout. Casey Fossum pitched 2 2/3 innings giving up 6 hits, 3 runs with 2 strikeouts. The offense didn't do much but was led by Ryan Church who was 2-4 with a rbi, Marlon Anderson was 1-4. Jeremy Reed was 1-2 with 2 walks, Nick Evans was 1-3 with a walk. Brian Schneider was 1-3. The Mets will play Baltimore again tomorrow night at home and it will be on SNY. The New York Yankees defeated the Pittsburgh Pirates today in a wild game by the score of 9-8. AJ Burnett got the start and just didn't have it at all for the first time this spring. He pitched 4 1/3 innings giving up 10 hits, 7 runs, 6 of them were earned, 3 walks and 1k. He gave up 3 homeruns. He said after the game that his mechanics were just messed up all day. He said he was messed up and that his arm feels fine. Damaso Marte pitched 2/3 of an inning giving up 2 hits and 1 run. Mariano Rivera pitched an inning, he gave up a leadoff single then proceeded to strike out the side. He is the man, greatest closer of all time. Phil Coke was outstanding pitching 2 innings giving up 1 hit, 0 runs, 4 strikeouts. Jose Veras closed it out with a scoreless inning giving up 2 hits. Johnny Damon led the offensive attack going 3-4 with a rbi, Derek Jeter was 1-3 with a rbi. Nick Swisher was 1-3 with 2 rbi and 2 walks, Hideki Matsui was 1-3 with a rbi and walk. Robinson Cano was 1-4 with a 2 run homerun, thats 2 days in a row he has hit a homerun, he is playing very well this spring. I am expecting a huge year out of Robbie Cano and so are the Yankees. Xavier Nady who has seemed to play very well since getting named the RF was 2-3 with a walk, Ramiro Pena was 1-3 with a walk. Brett Gardner was 2-3. The Yankees got Ivan Nova back, he was a rule 5 pick for Padres, they assigned him to AA-Trenton. Jorge Posada said before the game it was so windy yesterday that Wang got blown off the mound a couple of times and he wasn't kidding. He was basically saying yo can't take anything from Wangs performance yesterday due to the weather. Derek Jeter laughed at his bruised pinky being on the back page of the newspaper, he said " I didn't even realize I was hurt." Derek Jeter would say that no matter what unless he just can't get on the field because its a major thing. The Yankees will take on Toronto tomorrow in Dunedin with Andy Pettitte getting the start.